Today, new features rolling out to Preview members on Xbox One and the Xbox app (beta) which will bring Arena On Xbox Live, special updates to Achievement Rarity and Looking for Group. Last month Xbox team released Clubs and Looking for Group on Xbox Live to Preview members on Xbox One and the Xbox app (beta). Arena on Xbox Live: Arena launches to Preview on Xbox One with the pilot title and legendary fighting game, Killer Instinct. 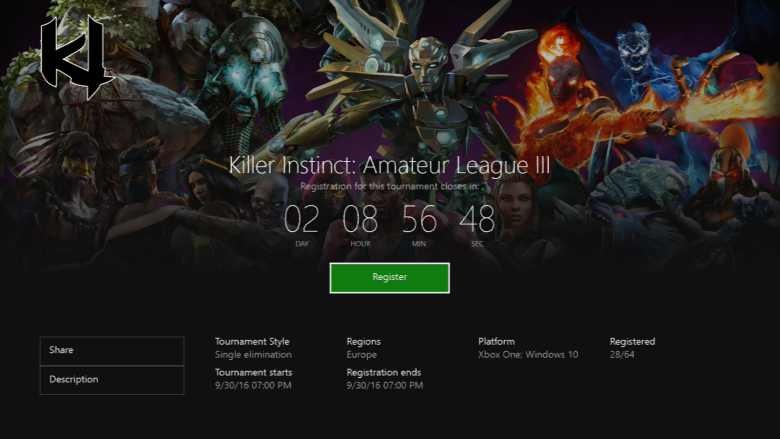 During Preview, you can look forward to competing in daily Killer Instinct tournaments across Xbox One and the Xbox app (beta) on Windows 10 PC. For the initial roll out, Arena will only be accessible to Preview members through practice tournaments on Xbox One in the U.S., with plans to add additional features and expand to the broader Preview audience later in October. To start competing, all you have to do is register on the Tournament tab in the Killer Instinct Game Hub. We’re really excited about the potential of Arena and eager to hear your thoughts as we evolve it and make eSports more accessible for gamers everywhere, regardless of skill-level. Achievement Rarity: Achievement Rarity, you’ll be able to discover just how unique an Achievement is among players of a given game and celebrate the Achievement itself with a special notification and diamond icon highlighting it. Unlock one today and let us know how you like the new animation! New Looking for Group (LFG) Features: Starting today, you will be able to create LFG posts for future gaming sessions – up to seven days in advance! Additionally, based on your feedback, you can now create LFG posts directly in a Club and control who sees them: just members of the Club or everyone on Xbox Live. When creating LFG posts, you can also note what language the party will be speaking and filter your LFG searches based on the language. Group Messaging on Xbox Live: Group Messaging helps you coordinate and keep in touch with your friends and fellow gamers by sending a single group message to everyone in the group. You can also add people to the group and dynamically change the conversation topic. Group Messaging will soon work across the Xbox app (beta) on iOS and Android devices.